the three Study Days a rich programme features seminary lessons, visits and practical demonstrations of the ancient techniques, with reports and communications by professors and participants, all specialists in the field, making this event one of the most important of its kind organised on an international level. 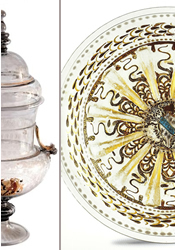 Our aim is to offer the scholars of Venetian glass, but also glass of the most varied traditions, an opportunity for in-depth study and encounters, with an ample exchange of knowledge and experience. In addition we hope that Venice may become more than ever the world centre for the study of ancient glass, but also that Venice be reconfirmed as one of the outstanding meeting places for scholars, artists, collectors of ancient and contemporary glass in its most diverse expressions and schools. This substantial and high-profile programme, particularly significant for the city, is undertaken by the Istituto within our agreement with the Fondazione Musei Civici di Venezia for various activities and events in the field of art glass.